Hackers from China have infiltrated the computer systems of the Wall Street Journal (WSJ), in the second reported attack on a major US news outlet. 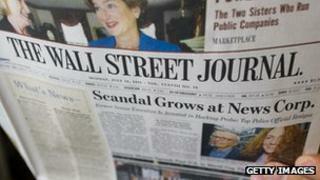 The Journal says the hackers were trying to monitor its China coverage. The New York Times reported earlier that Chinese hackers had "persistently" penetrated its systems for the last four months. Beijing has been accused by several governments and companies of carrying out cyber espionage for many years. "China is also a victim of hacking attacks. Chinese laws clearly forbid hacking attacks, and we hope relevant parties takes a responsible attitude on this issue," said spokesman Hong Lei. The Journal's publisher, Dow Jones & Co, released a statement on Thursday saying hacking attacks related to its China coverage were "an ongoing issue". "Evidence shows that infiltration efforts target the monitoring of the Journal's coverage of China, and are not an attempt to gain commercial advantage or to misappropriate customer information," a spokeswoman for the newspaper said. "We continue to work closely with the authorities and outside security specialists, taking extensive measures to protect our customers, employees, journalists and sources. In 2011 US media reported that Chinese-based hackers were suspected of a "significant" cyber attack on defence firm Lockheed Martin. The paper has completed a network overhaul to bolster security, she added. Meanwhile, the New York Times said the attacks on its systems coincided with its investigative report into claims that the family of Chinese Premier Wen Jiabao had amassed a multi-billion dollar fortune. The report, which was dismissed as a "smear" by the Chinese government, said Mr Wen's relatives had amassed assets worth at least $2.7bn (£1.7bn) through business dealings. It did not accuse the Chinese premier of wrongdoing. The hackers first broke into the Times' network in September, as the report was nearing completion, the paper reported. They used methods "associated with the Chinese military" to hack the computers of David Barboza, the paper's bureau chief in Shanghai who wrote the report, and one of his predecessors, Jim Yardley. Media captionThe BBC's Damian Grammaticas: "On the day it (NY Times) published, its computers came under attack"
Internet security firm Mandiant, which was hired by the Times to trace the attack, followed the hackers' movements for four months, to try to establish a pattern and block them. The hackers installed malware which enabled them to access any computer using the New York Times network, steal the password of every employee, and access 53 personal computers, mostly outside the Times offices. The Times said experts had found that the attacks "started from the same university computers used by the Chinese military to attack United States military contractors in the past". Beijing has been accused by several governments, foreign companies and organisations of carrying out extensive cyber espionage for many years, seeking to gather information and to control China's image.